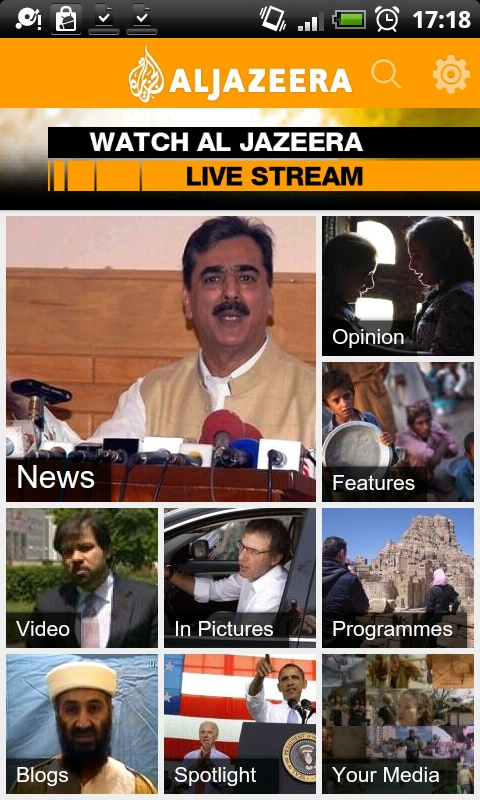 In a recent push by Al Jazeera the Middle East’s largest news Network has released two new smartphone apps for the Android and BlackBerry in a shift from its standard Live Streaming model provided for iPhone users. The launch comes a couple of months after the first Al Jazeera English Live Android app quietly hit the market this year raising the Al Jazeera smartphone app stack to 4 apps running on BlackBerry, Samsung Wave (Widget), Android, and Nokia. The Android app has a simple and slick design providing access to the grid making up the landing screen of the app. Categorizing its content into 9 blocks: News, Opinion, Features, Video, In Pictures, Programmes, Blogs, Spotlight, and ‘Your Media’. The landing screen also has a ‘Breaking’ heading to display whatever breaking news that’s available on the network which when not available is replaced with a link to Al Jazeera English’s Live Stream when clicked launches the Al Jazeera Live android app, or otherwise do nothing, which I think Al Jazeera have either overlooked or are feeling overconfident that whoever’s installing the new app has the steaming one as well (at least not this guy). We put it up against other global news network apps to compare focus on content and functionality and the differences are striking. Comparing it to CNN’s Android app (but is inaccessible to many countries in the Middle East for some reason) that was released only last month, Al Jazeera has an entirely different target audience if its app has any say on the matter. With one block of the landing screen dedicated to video, it’s quite a disappointment when the user is taken to a screen containing a news piece with yet another icon to click only to be asked whether the video be displayed via browser or YouTube. Al Jazeera should remedy that by providing the app with some native video streaming capabilities instead of sending users on their way to get the rest of the day’s news from YouTube. The least I can say is that the app is antisocial. The first thing I did was attempt to share a story with friends I found it to be an impossible task. This means users will have to use the network’s mobile web version that surprisingly provides multiple options for sharing on Facebook and Twitter. The app does have a Preload articles functionality that’s displayed in the Setting’s tab (which cannot be disabled) that allows users to preload the apps articles minus images which can be a bit confusing when launching the app without Internet access for the first time. The recent uprisings in the region helped Al Jazeera catapult into a global position not before displayed by the Doha based network, with a large part of its coverage attributed to event bystanders providing their opinion/footage via mobile phone video cameras. For this reason an Android app is expected to contain functionality to upload a video or image file without leaving the app. But again, the ‘Your Media‘ tab only includes a button to send Al Jazeera content through the device’s default email app which launches when clicked. 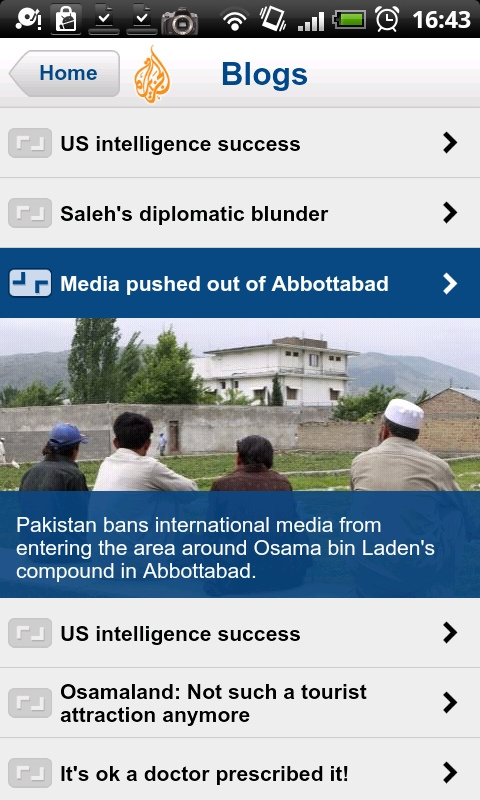 It appears Al Jazeera released this version of the app to give its viewers/readers a quick way to read the latest news with the least possible clicks as oppose to its online mobile web version. For now they’ve successfully done that, and nothing more. This being version 1.0 of the app we expect to the app to evolve to fall inline with the network’s recent adoption of social media led by its New Media team that’s given us products like the ‘Twitter Command Center‘ dashboard and it’s Citizen Journalism portal Sharek, hopefully soon. Till then you can find it here in the Google Android Market free of charge.